The Global Times said both sides were engaging in a "reckless game" that runs the risk of descending into a real war. China won't come to North Korea's help if it launches missiles threatening U.S. soil and there is retaliation, a state-owned newspaper warned on Friday, but it would intervene if Washington strikes first . The Global Times newspaper is not an official mouthpiece of the Communist Party, but in this case its editorial probably does reflect government policy and can be considered "semi-official," experts said. China has already warned both Washington and Pyongyang not to do anything that raises tensions or causes instability on the Korean Peninsula. In an editorial, The Global Times said China should make it clear to both sides: "when their actions jeopardize China's interests, China will respond with a firm hand." "China should also make clear that if North Korea launches missiles that threaten U.S. soil first and the U.S. retaliates, China will stay neutral," it added. "If the U.S. and South Korea carry out strikes and try to overthrow the North Korean regime and change the political pattern of the Korean Peninsula, China will prevent them from doing so." The Global Times warning comes at the end of a week of threat and counter-threat between Washington and Pyongyang, and as the United States weighs up its options to deal with the threat of North Korea's nuclear and missile program. On Tuesday, President Donald Trump threatened to respond to further threats from North Korea by unleashing "fire and fury like the world has never seen." 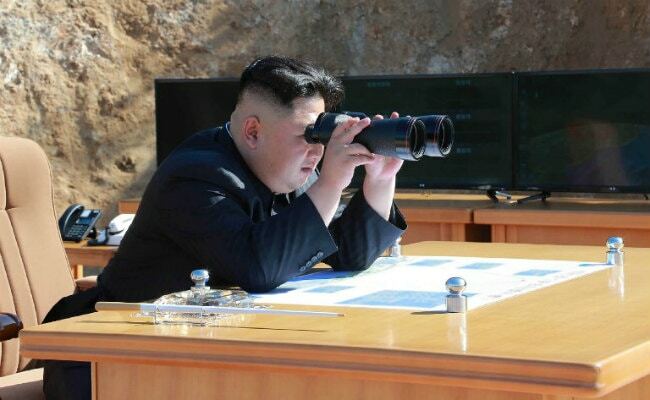 Pyongyang in turn threatened to strike the U.S. territory of Guam in the Western Pacific with ballistic missiles. The Global Times also cited reports that the Pentagon has prepared plans for B-1B strategic bombers to make preemptive strikes on North Korea's missile sites, and a strongly worded ultimatum from Secretary of Defense James Mattis that North Korea should not consider "actions that would lead to the end of its regime and destruction of its people." The paper's comments also reflect the 1961 Sino-North Korean Treaty of Friendship, Cooperation, and Mutual Assistance, which obliges China to intervene if North Korea is subject to unprovoked aggression- but not necessarily if Pyongyang starts a war. "The key point is in the first half of the sentence; China opposes North Korea testing missiles in the waters around Guam," said Cheng Xiaohe, a North Korea expert at Renmin University of China in Beijing. With the situation on the Korea Peninsula sliding dangerously towards the point of no return, Chinese media are starting to declare their positions on any potential war, he said. "Secondly, in a half-official way, China is starting to review and clarify the 1961 treaty." China has become deeply frustrated with the regime in Pyongyang, and genuinely wants to see a denuclearized Korean Peninsula. But it has always refused to do anything that might destabilize or topple a regime which has long been both ally and buffer state. That's because Beijing does not want to see a unified Korean state allied to the United States right up against its border: indeed, hundreds of thousands of Chinese soldiers died during the 1950-53 Korean war to prevent that happening. So for now, the current uneasy status quo for China still seems better than the alternatives. That is doubly true ahead of an important Communist Party Congress in the fall, at which President Xi Jinping wants to project an aura of stability and control as he aims to consolidate his power at the start of a second five-year term. Nevertheless, experts said debate is underway behind the scenes in China about its support for the North Korean regime. In an article on the Financial Times China website in May, for example, Tong Zhiwei, a law professor at the East China University of Political Science and Law in Shanghai, argued that China should make terminating the 1961 treaty a near-term dipomatic goal, because North Korea, also known as the DPRK, had used it as cover to develop its nuclear program and avoid punishment. That, he wrote, was not in China's interests. "In the past 57 years, the treaty has strongly protected the security of the DPRK and peace on the Korean Peninsula, but it has also been used by the North Korean authorities to protect their international wrongful acts from punishment," he wrote.